One of the most interesting astronomical events of this year, at least from view of the astrospectroscopy, was certainly the periastron passage of the Be-binary δ Scorpii. δ Sco is a bright, interferometrically discovered binary system with a primary of the spectral type B0, an angle of inclination of its orbital rotation axis regarding the line of sight of the observer of 38° and a companion star, whose spectral type is at present assumed as type B, and which moves on an elliptical orbit with the eccentricity e = 0,94 and a period of approx. 10.6 years. Fig. 1 shows the change of radial velocity during the periastron passage of August - September in 2000, whereby the observation density was not sufficient for a precise determination of the periastron time. Red points = measurements of Miroshnichenko [1, 2]; the green line represent calculations of Tango et al. and the orange line the “best-fit model” of Mailland et al. . In the context of the 2011 campaign the pleasing high participation of international observers since January has led to an observation density higher than previously obtained for δ Sco. 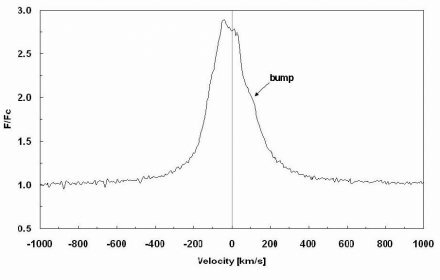 Most of the spectra were measured using the program SpecRave, developed specially for radial velocity measurements (a co-operation between my colleague Roland Buecke and the VdS group „Computer Astronomy“. Fig. 2 shows the result of our radial velocity measurements since January this year until today. The primary goal of the campaign was to determine the time of the periastron passage as precisely as possible. 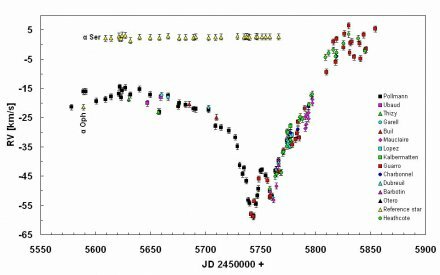 The high observation density allowed this time to be determined using a method commonly used in the in the observation of variable stars. This method is based on calculating the linear regression for the descending and rising parts of the curve. The time of the periastron passage then lies at the intersection of the two regression lines. Our observations showed this to be 2011-07-01, 02:30 UT. The deviation from the predicted date 2011-07-05 amounts about 4 days. Additionally a feature was seen in the radial velocity curve which was not expected in this form neither by the professional nor amateur astronomers. This was the „double dip“ between 11th and 23th July (JD 2455754 – 2455766). 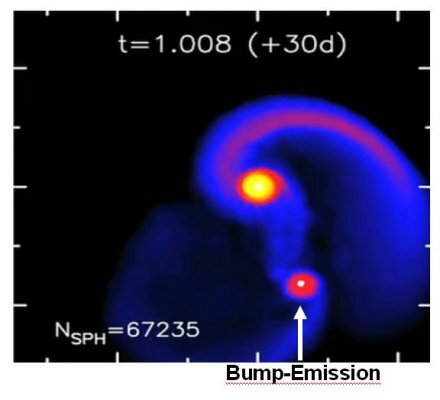 Initial speculations from the professional astronomical community suggest that there may be a third body in δ Sco binary system in the proximity of the companion. Based on this hypothesis, the possible existence of a third component is derived on basis of an analysis of the radial velocities from 1902 to 1975 with a period from 302.6 days ± 0.26 on an eccentric orbit . 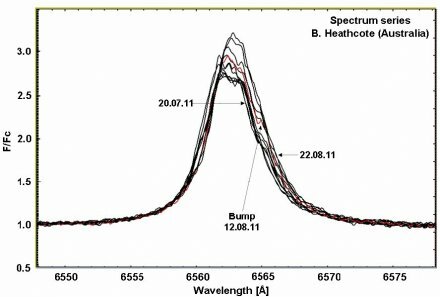 A further unexpected result of the campaign is the development of a „bump “on the red flank of the Hα peak in high resolution spectra from the swiss amateur Patricia Otero between 31th July to 6th August (fig. 3a), and particularly clear from the australian amateur Bernard Heathcote on 12th August (fig. 3b). In the model simulation (fig.4) of the Be star researcher A. Okazaki , which is based on results from the periastron passage in 2000, the formation of the circumstellar disk around the secondary seems to be a robust feature due to the tidal interaction with the secondary. If approx. 20-30 days after the periastron, the terrestrial observer was looking in downward direction (in the i, j, k coordinate system of unit vectors) of the animation frame, the secondary’s circumstellar disk would show up as an enhancement a "bump" in the red wing of the Hα-emission .